I get LOTS of emails a day. Thousands each week. I have gotten pretty good at looking at the subject line and then deleting, if it smells like spam. The next place to look is the first line or two of the email… again, if it smells like spam, I delete it. I hate to seem so brash, but I’m hurried. That isn’t your FAULT, but it might be your PROBLEM. If you create an email message that looks like spam, I MIGHT DELETE IT. My process becomes a FAIL, or PROBLEM, for you, even though it isn’t your FAULT. Whoever sent this has no excuse – they are PR people who were hired to be communications experts… but couldn’t even craft an email properly. A communications expert who couldn’t communicate… go figure. Why am I writing this here? Because YOU might be doing the same thing! Be sensitive… very sensitive to the person you are writing. Are you turning them off in your subject line, or in the introduction, or by the length of the email? I just created one of my new favorite recordings on EMAIL ETIQUETTE – I’m convinced MOST of us are doing it wrong. It is called Effective Email Communication. You can see the 12 modules here… it is a short program (around an hour? ), but I dive into what a lot of people make mistakes on. DO NOT BUY INDIVIDUAL MODULES – that is a design issue we need to fix. The price for this entire training is $50. If you get it this week I’ll do it for $40 (I have to delete this line after this week). You can pay here, let me know in the description/comments box what your JJ username is, and you can access it online, after you login to JibberJobber. My heavens, stop making those email mistakes that makes you look like an email noobie! I agree with you. I would add one thing: it is still possible that a non-spammer would use Mr. or Mrs. to address a person they have not met; he/she may be from another country with a different culture. Would you agree? But of course, the “Can we interest you in..” sort of kills it..
Sylvie, good catch. I was on a webinar a few weeks ago with a French professional who said the same thing. I almost put something in the blog post about that…. but didn’t. You are definitely right…. AND, in the last week I’ve gotten probably two dozen legit emails from people who have seen me speak who called me Mr. Alba… as casual as I was, I didn’t break out of that formality. 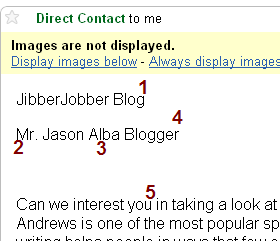 Mr. Jason, I’m assuming you wouldn’t be interested in this million dollars I have in a Nigerian bank account either?